Lionel 408E standard gauge train set with electric engine, four compartmented coaches and original boxes, sold via the Internet for $35,395.82. Noel Barrett Auctions image. NEW HOPE, Pa. – Prior to Noel Barrett’s richly varied May 21, 2011 “Something for Everyone” sale, some collectors speculated that the whimsical clockwork veggie man on the catalog cover might take the blue ribbon on auction day. While the cheeky, 16-inch papier-mache Halloween figure did surpass expectations to sell for $16,520 (all prices inclusive of 18% buyer’s premium); it was a modestly estimated Lionel train set that took the express journey to the top of prices realized. The Lionel 408E standard gauge set with electric engine and twin Bild-A-Loco motors pulled four compartmented coaches identified as 412 California, 413 Colorado, 414 Illinois and 416 New York, the latter being an observation car. All of the cars – which were finished in tan and chocolate brown with cream window frames and peacock-blue accents – came with their original boxes. The set drew numerous competitors, with an Internet participant claiming the lot for $35,395.82. The bidder eventually drove six hours to Pennsylvania to collect his prize. “It was an exquisitely rare train set in that particular color scheme. The selling price was a very nice surprise for the consignor and proved yet again that, in today’s marketplace for antique and vintage trains, it’s the collectors who call the shots,” said auction company owner Noel Barrett. Trains proved to be the sale’s strongest suit. An American-profile Carette gauge 1 #2350 steam loco and tender featured in Paul Schiphorst’s book The Golden Years of Toy Trains had been entered in the sale with a $12,000-$15,000 range. But with energy to burn, it powered its way to a $29,500 finish. Marklin Central-Bahnhof train station #2651, hand painted with candlelit interior and furnishings, $23,600. Noel Barrett Auctions image. Superbly hand painted and designed for illumination by candlelight, a Marklin Central-Bahnhof train station #2651 was outfitted with a table, chairs and benches. Its sumptuous details included etched and stained glass windows, doorway arches, a canopy and ticket-queue rail. Perhaps the best preserved of all known examples, the perennially popular German train station achieved $23,600 against an estimate of $10,000-$15,000. Toys with a firefighting theme “never suffer a shortage of interest,” Barrett remarked. A case in point was the salesman’s sample fire ladder wagon made by Seagrave Co., the oldest continuous manufacturer of fire apparatus in America – and still in existence. The 50-inch-long sample fire wagon from the 1890s included an array of ladders, fire axes, extinguishers, lanterns and fire buckets. It settled just short of its high estimate at $10,030. 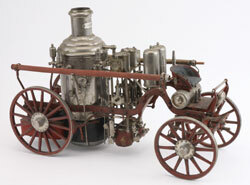 A mechanical marvel replicating a spirit-powered fire pumper was described in Barrett’s catalog as “one of the most amazing…we have seen.” Fully functional, it included double-pump pistons, valves and a flywheel crafted from brass and iron, with nickel-plated wheel rims and other components. Estimated at $6,000-$7,000, it blazed to $8,260. Early automotive advertising showed its muscle in the form of a self-framed Marathon Tires sign depicting two anxious couples in a red open tourer, navigating a narrow, craggy ledge. Retaining an original paper label on verso from the famed tin sign maker Kaufmann & Strauss, the 22¾ inches by 19¾-inch advertisement applied the brakes within estimate at $16,520. 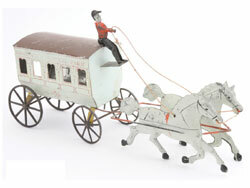 George Brown painted-tin horse-drawn omnibus stenciled “Broadway & Central Park,” $12,980. Noel Barrett Auctions image. 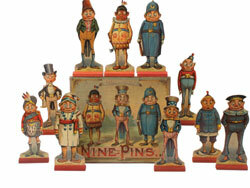 Several highly desirable American painted-tin toys were offered in the May 21 auction. Two of the best were attic finds. Discovered in California, a Fallows 1886 (patented) Buffalo Hunter, whose design includes a pair of rocking buffalo on a wheeled base, surpassed its $2,000-$3,000 estimate to realize $7,670. A George Brown horse-drawn omnibus stenciled “Broadway & Central Park” was a fresh find from a Long Island home. It had a smooth ride all the way to its above-estimate $12,980 destination. A third 19th-century American toy highlight in the sale was the Hull & Stafford “America” clockwork locomotive that came directly from the collection of Disney animator and train collector extraordinaire Ward Kimball (1914-2002). Made of stenciled tin and wood with cast-iron wheels, it was one of only two toy trains retained by Betty Kimball (1912-2010) when her husband’s incomparable collection was consigned to Barrett’s in 2004 and 2005. “The Hull & Stafford ‘America’ was always one of Betty’s favorites,” Barrett noted. Estimated at $3,000-$4,000, the charming, primitively styled red and yellow locomotive was a crowd favorite. It ended its bidding run at $11,800. 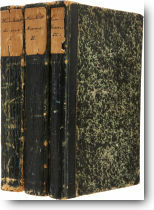 Other standouts included a set of McLoughlin paper litho on wood Brownie ninepins $7,670 (est. 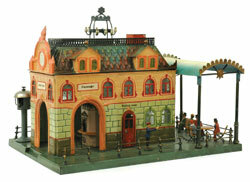 2,000-$3,000) and an Erzgebirge painted-wood village consisting of 12 structures and numerous accessories, all housed in a bentwood box, $5,310 (est. $700-$1,000). An antique Parisian perfumery came to the auction podium stocked with a multitude of miniatures that included various fragrances in glass bottles, powders, soaps and pomades arranged on mirror-topped counters and on vanity shelves. The deluxe emporium was also accompanied by a shop attendant: a well-dressed, bisque-head doll outfitted in fashionable turn of the 20th century attire. 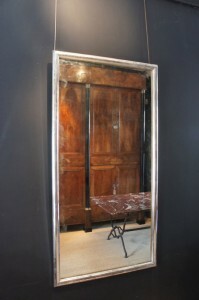 Estimated at $2,000-$3,000, it clinched a winning bid of $4,425. Barrett’s next sale is planned for the weekend of Nov. 16-17, 2012. To contact Noel Barrett, call 215-297-5109 or email toys@noelbarrett.com. Visit Barrett’s website at www.noelbarrett.com. The Gypsy people, also called Roma or Romani, can trace their origins back more than 1000 years to the Indian subcontinent. Gypsy bloodlines and cultures have since proliferated across Europe and most of the rest of the world. During the early part of the 20th century, many Gypsy families arrived in the United States, bringing with them their culture and of course their possessions, which tend to showcase the Roma’s unique skill with intricate metalwork. This skill is easily recognized in a form of rare and now highly valued antique jewelry. Metal smelting, plating, and shaping skills were believed to have developed among the Roma more than a millennium ago and have since been passed down from one generation to the next. As a result, the most beautiful and prized antique jewelry of this century is often set in or composed of various metals, specifically copper and gold. Gold cuff bracelets and earrings, gold belts, and gold medallions made by Roma are often more valuable then the gold used to make them– worth more than their weight, so to speak. But there are other reasons why these pieces are so sought after, many originating in aspects of the Roma culture and lifestyle. For example, as a nomadic people, Gypsies historically limit their possessions to what they can carry or wear, so jewelry has become a form of wearable currency. But this exposes items to damage and loss and so, as generations go by, truly antique jewelry can become harder to find. The Roma also traditionally bury possessions with their owner upon the owner’s death, the possible exception being a single ring given to the owners oldest daughter. Jewelry belonging to a deceased person cannot be sold, and even as these restrictions have changed and lifted over the years, it still remains taboo to sell this jewelry within the Roma community. All of these factors contribute to a general attrition of truly authentic antique jewelry displaying Roma metalwork. The current rarity of these items can also be traced to the 1930’s and the great depression which left many families in financial circumstances that forced them to pawn or melt antique jewelry pieces down in order to sell the gold. A few features to look for when evaluating antique jewelry with Gypsy origins: First, the metalwork. Gems and stones are often set in the pieces, but Gypsy owners typically preferred to invest in gold, since gold is more difficult to counterfeit. Intricate wirework, or filigree, is also a common feature of authentic Gypsy pieces. Keep an eye out for Gypsy motifs as well, the most popular being horseshoes, hearts, and the head of a beautiful woman in profile, often referred to as “the Gypsy queen.” If you happen to own antique jewelry displaying these images, keep in mind the Gypsy belief that such pieces are good luck to own, but bad luck to sell. This also, of course, escalates the pieces in both rarity and value. At first glance, this looks like an authentic Empire chest. It is a fine intarsia decoration, old-looking fittings, good varnish etc. 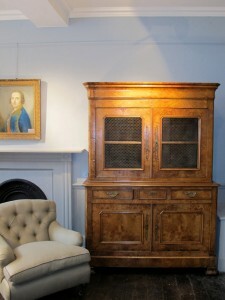 To a new collector, this would appear to be made around 1850 but buyer beware. This is a new product! 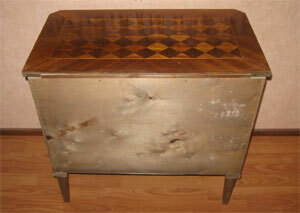 This chest is actually made around 1950. How can you tell? A closer look behind the chest is the giveaway. 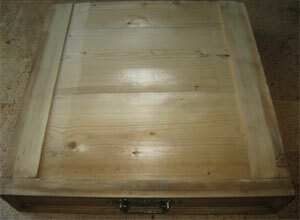 The back of the chest and the bottom of the drawers are made of plywood. Plywood is an older wood, but a real Empire chest would have a solid back and the drawers would be solid also. Take a look at the back – does this look like a solid back? 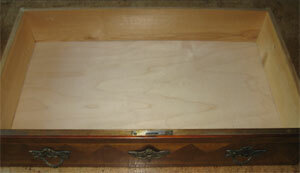 Here is a reproduction drawer base in plywood. Here is an old drawer base. 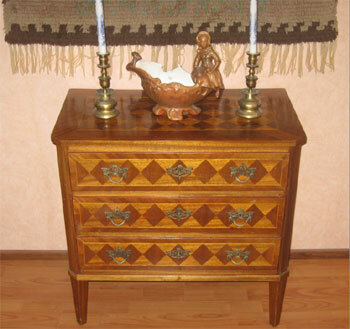 (Neo Renaissance chest 1890 ) It is made of solid wood.